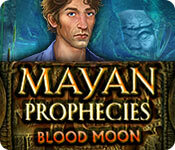 Mayan Prophecies: Blood Moon is rated 4.2 out of 5 by 9. Rated 5 out of 5 by SparkleGlow100 from Nature and outdoors - waiting to be explored. 18-20 HOPS Available at BFG since 2014. Completed game. Some of the scenes were just entrancing, for example the path you come across winding past a waterfall, over a bridge, and up into the woods. You'll get: moss, swamps, mountains, hills, mushrooms, frogs, lily pads, crickets, moonlight, caves, fires, rocks and statues, villages, and water! My first impressions were that this game had a great start, with great atmosphere and the feeling as though I was in for an adventure. It settles into a steady pace, and is the kind of game you can play over several days, come back to it at any time, and instantly get into. A wonderful first HOP - underwater, with relaxing music. Items are visible, but well blended/disguised so that you can't instantly spot them. So that made the HOPS more fun! Although I think they got progressively easier. STORY - Watchout, a power-hungry devotee of the Jaguar God is on the prowl and wants to release him! Can you help deter and avert the impending disaster? GRAPHICS - Widescreen or fullscreen. Great graphics. Great scenes. HOPS - 18- 20. GREAT VISIBILITY & WELL HIDDEN (SO RARE!). Lovely and enjoyable to play. PUZZLES: All skippable. SOUNDS - with 4 adjustments. Pleasant, appropriate and atmospheric. Music is totally separate and ISN'T constant! Wonderful. So I did listen to most of it! MAP: TRAVEL JOURNAL: YES DIFFICULTY SETTINGS - 4 interchangeable HINT: Guides and leads INVENTORY - lockable CHARACTERS: Minimal interaction – but believable characters when you do meet. Rated 5 out of 5 by tutortime from Great Game ! Really nice game in its length and beautiful scenes. Rated 5 out of 5 by pennmom36 from Evil vs. Good: When Friends Go Their Separate Ways Gregory and Fernando were best friends, until they came across an artifact that changed their friendship and their lives forever! Fernando Gomez, fueled by evil, has been trying to summon Xalan the Jaguar God, and has been turning everyone into Jaguar slaves including Gregory. Thankfully, Sophia the Moon Goddess and priestess of Chelia has agreed to help you capture Gomez and put an end to all this madness once and for all. I absolutely loved the original Mayan Prophecies, but I didn't think the second one did this story any justice, but this third edition might be the games saving grace. The graphics are fairly well done and I enjoyed the underwater scenes that made for a nice change of pace. 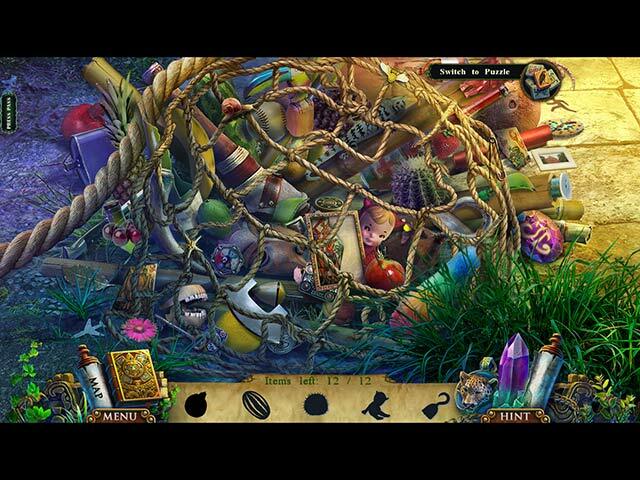 The HIDDEN OBJECT SCENES are well done, mostly interactive list finds, some of the scenes revealed a fragment under every object found that would eventually open up a chest to reveal the final item. You have the option of switching to a game of MAHJONG instead. 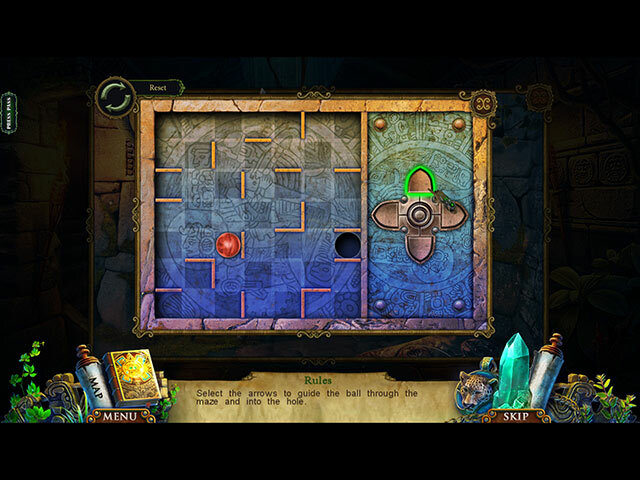 There are a lot of MINI GAMES and puzzles such as placing 6 tokens on a board so that the rays each token projects doesn't cross through any other token. Most puzzles are fun, not frustrating. The COLLECTORS EDITION include 25 hidden TOTEMS that will release a bird for you to catch and 36 MORPHING OBJECTS, as well as a ton of ACHIEVEMENTS to earn. The CE also has the usual WALLPAPERS, CONCEPT ART, MUSIC, a built in STRATEGY GUIDE and of course a BONUS CHAPTER. Enjoy! Rated 5 out of 5 by LogieBaby from a strong contender for game of the year I purchased the CE version of this wonderful game in part because the Mayan series is an excellent one, in part because the series creators are among the best in the business and in part since the demo proved to me that as a stand alone game Blood Moon certainly rises well above the mediocrity that has been so abundant in 2014. The story line is somewhat compelling although it is in the category of those requiring the player to suspend belief. We have another evildoer bent on destruction and it is our task to save the planet as we know it. We get an assist from a character in the game who is transformed into a jaguar by the bad guy. Now I am as fed up with animal helper as most of us but in this case the big cat is so lifelike and does not do things any real life jaguar could not do. In fact all of the cats in the game and there are lots of them bring a significant degree of realism in their movements and sounds. Kudos to the devs for giving us such beautiful creatures. 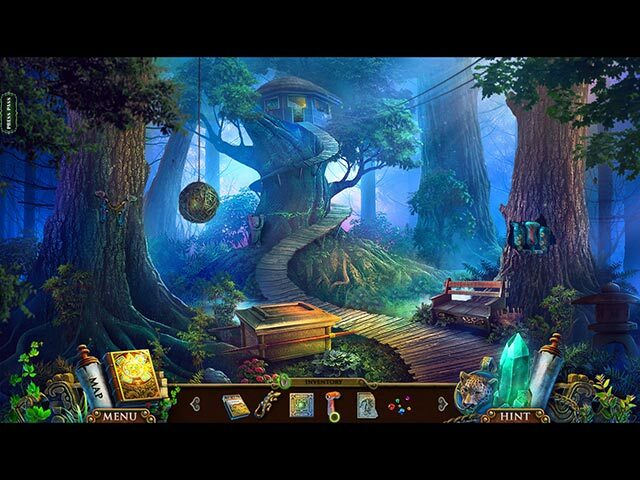 The hidden object segments and the puzzles are top notch with some of the puzzles quite cleverly done. The graphics throughout the game are among the best we can hope to find. The game is of above average length including a very long CE bonus chapter. For those who appreciate collectibles, Blood Mood has them. This is a game that should be acquired in the CE version since it has so much to offer. Having said that, for any game player who for whatever reason cannot afford the CE, be certain to add the SE to your collection. 2014 for me has been an overall disappointment regarding game quality. Makers have been churning them out with such rapidity that style and substance suffer. Slow down developers and do more thinking and less production line forms of entertainment. Blood Moon is my very favorite game this year, so far. I would be thrilled to have something else take its place during the last third of the year. Rated 4 out of 5 by ninja226 from Interesting story involving jaguars What stands out for me playing this game is the artwork, which is excellent, in high def, and easy on the eye. The story is interesting, involving jaguars and even has a jaguar who helps you at several points in the game. The game is quite long, with a lot of actions to take, many puzzles and HOPs to play. Mahjong is an alternative to HOPs. Hint & skip is disabled on expert mode, but helpful message and '+' indicator remains available. The Hint is in the form of '!" indicator on the Map rather than glowing arrows moving you to appropriate location. This is a highly playable game with absorbing puzzles and HOPs. Has a happy ending, but isn't too abrupt. Rated 3 out of 5 by catbag8717 from Incredibly Fun, But Quite Problematic BASED ON COMPLETED STANDARD EDITION GAME I've never really been fond of EleFun games before, but for some reason, I really liked this game. It turned out to be quite fun, even if it was not the best game in the world. The story started off quite well. The game jumped straight in to the action with your best friend, Gregory, pounding on the door demanding to be let in. From here, he was taken by our antagonist, turned in to a jaguar and chaos ensued. I was impressed with the story to begin with: it coasted along quite nicely with a couple of nice twists, and I was really looking forward to what was happening next. The demo ended on a great note and we finally found out who our antagonist was. This was a great move by the developers, to keep me guessing and not reveal our enemy straightaway. With the demo's great ending, I looked forward to an exciting continuation. But that is where the story just dropped. And I do mean COMPLETELY dropped. I've heard of games slacking off for the middle portion, but this was absolutely ridiculous. If you asked me to sum up the story for the remainder of the game, this would be my response: “Story? What story?” After the game picked up where the demo left off, all we did was collect fresco pieces to fix the broken altar. This dominated the remainder of the game- I'd say about half- and at the end of it all we found out was how to stop our villain. Talk about a huge let down! There was absolutely NOTHING after the demo ended which added to the story. The story was pretty much nonexistent for the remainder of the game, which is really disappointing. There were even things explored in the demo which were removed after it ended. For example, the story made connections between Gregory and our villain at the start, but then it was never mentioned again? Talk about weird. I think that whoever came up with this story needed to do some serious editing, because if there was a plot after the demo, it was completely lost on me. Collecting the fresco pieces should not have taken as long as it did, only about half an hour at the longest. There should have been some more focus on the villain or at least our villain should have tried to stop us. I saw the villain go in to a temple and then he was gone until the end of the game. Speaking of the ending, it was conclusive, but not really entertaining. The ending could have been done a lot better, but based on the rest of the “story”, I wasn't expecting much. It did not exceed my expectations. With pretty much no story after the demo's end, I'm disappointed. This story could have been executed so much better, and was in need of some serious refinement. It seems the developers put their best foot forward for the demo and then just chucked it together for the rest of it. I would not have completed the game if the gameplay wasn't so fun. It was the highlight of this game for me. For starters, I really, really enjoyed the HOS. They were incredibly fun and came in a nice variety: there were word list junkpile, silhouette junkpile and fragment junkpile. All three included extra-step objects, which was nice. Even though I enjoyed them a lot, I found the HOS to be quite easy. I rarely used the hint, as I could generally find all the objects in about a minute. I think Elefun needs to work on making their HOS a bit harder. My other complaint is that the variety disappeared after the demo. They were all either junkpile word list or silhouette. My favourite HOS- the fragment junkpiles- were gone, never to be seen again. I think there was maybe 1 or 2 of them after the demo, then they disappeared, which was a real shame. I was hoping they would be present throughout the game. As far as quantity goes, the developers have done a fantastic job. All up, there are 21 HOS in the game, with some scenes being repeated twice, I think one even three times. This is a fantastic number. Also, I am ecstatic that the HOS outnumbered the puzzles for once! When it comes to spacing out, they are generally spaced out well, but I did note that, at one stage, there are 3 HOS one after the other. This might annoy those who aren't fond of HOS. I also found that I had to replay a HOS again IMMEDIATELY AFTER I had played it the first time. If I did not love the HOS so much, that would have annoyed me. For those who do not like HOS, there is a mahjong option available, and it is pretty basic. The puzzles were another reason I kept playing on. They were fun to attempt and I enjoyed every single one of them. That being said, like the HOS, they were incredibly easy. They really did not offer much of a challenge at all, which was disappointing. I think I had to skip 3 in total. There were 19 puzzles in the game all up. Now I really am not the best at puzzles, yet I was able to solve 16 out of 19. What does that say for the difficulty? I thoroughly enjoyed these puzzles, but perhaps they need to be made a bit harder? This game has done quite well when it comes to additional gameplay features. There are two- + objects and an animal helper- and both are awesome. The + objects were executed well. There is an indication of when they can be interacted with, there was never more than two in the inventory at once and- save for the fan- they were used pretty quickly. There were also lots of them. I really enjoyed using them. The other feature is the animal helper. I liked this because, for once, it was relevant to the game. Our helper here is Gregory, who has been turned in to a jaguar by our villain. Gregory is used realistically, which is always nice to see. His main purposes are retrieving things or using his claws to tear things. The feature was used fairly often in the demo period, but not so much as the game wore on, which was quite disappointing. I was hoping it would be used a lot more, mainly because I enjoyed it so much. As much as I enjoyed this game, I must comment on the challenge level, or lack thereof, in the adventure component. This game is insanely easy. All the tasks, HOS and puzzles are incredibly straightforward and do not differentiate from the norm at all. I played this game on advanced mode and was not stuck ONCE. I even checked the map, and it still shows where there are tasks to perform. I was surprised at this, because it usually only does that for Casual. Also, there was a click penalty in HOS, but I had to click maybe 20 times before I got it? Even on advanced mode, this game was a cinch, which was a little disappointing for me. I like to be challenged in a game while being able to enjoy it. I shouldn't have to choose between one or the other. I strongly advise the developers work on making their games a lot harder. The basic features have been done extremely well. There is a diary (YES!) which was really good for keeping track of events. I also liked to read the journal entries. There is a working map as well as a custom difficulty, which does allow you to tinker with things to make the game slightly harder. Overall, kudos to the developers on such great gameplay. The graphics were quite good too. They were drawn with some nice detail and great colours that suited the game's atmosphere well. All the scenes were clear, and I really liked the character designs. They were incredibly lifelike and excellently done. There was also lip-synch, which added to the realism. The voice-overs were standard. I have no issues. FEATURES 4 modes of difficulty: Casual, Advanced, Hard and Custom. Differences are standard. I played Advanced and really found no difference to Casual, apart from slower charge times. Hint/Skip- both recharged at a decent speed for advanced mode and the hint is useful outside HOS. Diary- good for keeping track of events, and I liked reading the thoughts of the main character. Map- The map is interactive and very helpful, maybe too helpful for advanced mode. It shows where tasks need to be performed. + Objects- These are executed well. Never more than two at once and there is an indication of when they can be used. Animal Helper- Used frequently and the beginning of the game, but rarely thereafter. I loved this feature and would have liked to see it used a lot more. WHAT DO I MISS OUT ON IF I BUY THE SE? Bonus Chapter- Not needed. Game ties up conclusively. Built-in Strategy Guide- also not needed, due to game's easiness. Achievements- some were story based and some gameplay based Morphing objects Collectible birds (25) Mayan Horoscope- I haven't a clue what this is. Wallpapers (9) Soundtrack Concept Art Screensavers WHICH IS THE BETTER BUY? I got the SE and was extremely happy with it. I don't think this game is good enough to warrant getting the CE. There are not many extras, and the game in general is just far too easy. I would not have wanted any extra game time. I was happy for the game to end when it did. ON THE GAME LENGTH This game is of standard length, probably because it is so easy. I'd say I got about 2.5-3 hours out of the main game on Advanced mode, although I really found no difference between that and casual. Overall, this is not the best game in the world- it is actually far from it- but it is one of the more enjoyable ones I have played in recent times. I enjoyed this a lot, but it sadly must only earn a three star rating from me. It would not be fair to award this higher when I found so much wrong with it. This is more like a three and a half star game for me- the game was far too easy and the story was not very good after the demo, but I had so much fun with it. I definitely recommend this as a good game for beginners to start off with, but download the trial and see what you think. Rated 3 out of 5 by grammakk from shhhhhh very quiet game, had to nudge myself awake to play once in awhile. except for the roar of the animals this was just a standard game to me. nothing exciting. the main character helping you find the fresco pieces didn't seem very worried about anything. play before you buy i suggest. i have wasted some good credits lately listening to the reviews without playing. Rated 3 out of 5 by cabanaeast18 from Nice game but....... This se game has: 1. Great graphics and story 2. Interactive, useful map 3. lots of different puzzles (some difficult) 4. Nice vos The downside for me is the fact that there is not much music, except in hos. I play games for relaxation and enjoyment. Part of that enjoyment, is the inclusion of music during the whole game. It sets and continues the mood throughout the game. p.s. I'm one of many who is not tired of the cute little critter helpers, although I liked the look and actions of the full grown cat.